It’s starting to seem like it wouldn’t be January without an Apple event, as the company announced on Wednesday morning that it will hold an education-related shindig in New York City next week. The fun starts on January 19, at 10 a.m. Eastern/7 a.m. Pacific. 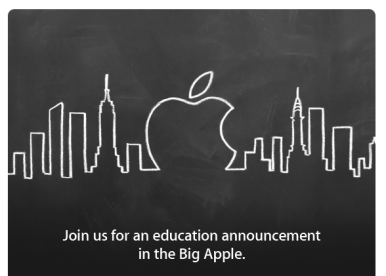 The invitation received by Macworld shows a New York City skyline drawn on a chalkboard, with the outline of an Apple logo in the middle. The event has some swanky digs, too—the Solomon R. Guggenheim Museum on Fifth Avenue. Rumors of a January Apple event first surfaced earlier this month, and they’d already crystallized around some sort of education topic. Given the New York City location, it also seems reasonable that publishing is in some way involved—perhaps an initiative for bringing textbooks to iOS devices? Will we finally see a version of iBooks for the Mac? We’ll have to wait until next week for those questions to be answered, but rest assured that Macworld will be on hand with live coverage on January 19, so join us back here then.